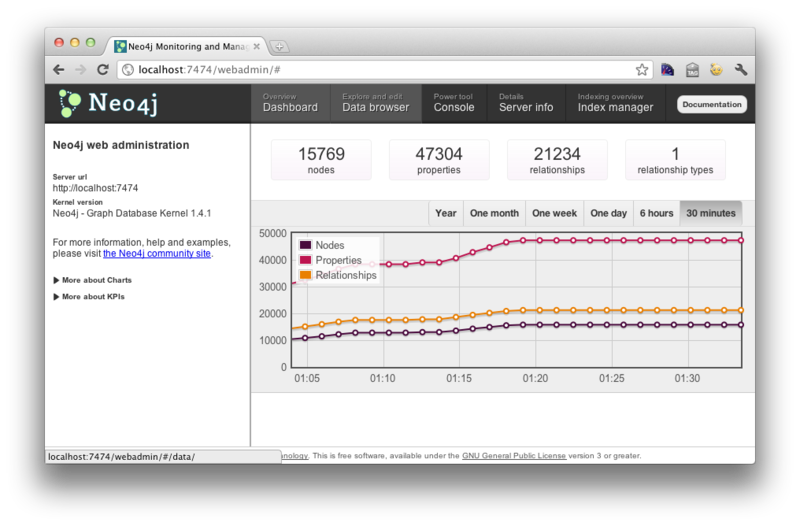 First play with Neo4j - Kristian Glass - Do I Smell Burning? There are many cool things that have emerged over the last few years that I’ve wanted to play with but not had a real reason to. One of these is Neo4j, a graph database; another tool to emerge from the “noSQL movement”. Well, when I was younger, I spent a LOT of time playing on MUDs (indeed, it was this that provided me with my first opportunity to write Real Code); for those who haven’t experienced them before, a common MUD family (ROM) has a movement system that consists of Rooms, discrete locations with a number of Exits to other rooms. Hey look ma, a graph! You can either embed Neo4j in your application or use its (very) RESTful API. If you're using Python, as I planned to, then it makes little difference to the code you write; there is an official set of bindings for the embedded case (neo4j.py), and a Github-hosted "Neo4j Python REST Client" which, incredibly usefully, offers a near-identical API. I opted for the REST client as that's my most likely future use case. For those unfamiliar with ROM MUDs (and if you are, I highly suggest popping along to The Mud Connector and giving one a try), each room has an id called a “vnum”; everything else above should be self explanatory. Rather than resolve an exit’s target_vnum into target_room while loading the area files, I opted to do this while importing into Neo4j. Actually getting the above into Neo4j was beautifully simple. I tried to do so pseudo-“declaratively”, so multiple runs of the importer would have no net difference on the database, and adding more features just meant running it again without any deletion step or duplication. Advanced queries are possible via embedded Lucene, but I don’t currently have a use case for them. And with the above shockingly small amount of code, I have my rooms and exits in Neo4j as nodes and relationships. Time to start playing with Traversals…!